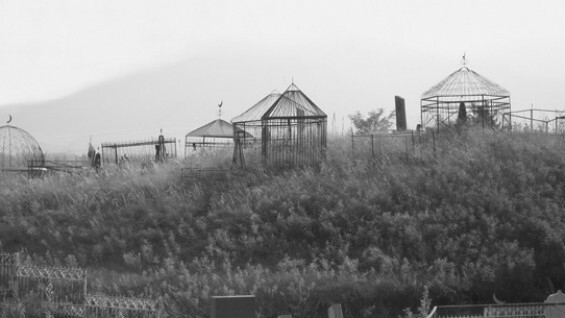 A Kyrgyz cemetery seen from a distance is astonishing. The ornate domes and minarets, tightly clustered behind stone walls, are so completely at odds with the desolate mountain landscape that at first they seem a mirage: miniature walled cities that appear unexpectedly on the edges of inaccessible cliffs, or stretch along deserted roads, displaying an otherworldly grandeur out of context with their isolated surroundings. As one approaches, the scale contracts; the monumental structures are reduced to an uninhabitable height. Graceful crescent moons, balanced on fragile metal rods, float above domes and peaked towers. Within the walls, scattered among the imposing mausoleums, delicate metal frames evoke the form and structure of yurts, peopled only by small metal portraits of the deceased and overgrown with weeds, for it is not Kyrgyz tradition for the living to frequent the graves of the dead. This exhibition is the result of photographer Margaret Morton’s three-year photographic project in the Kyrgyz Republic. From 2006-2008, Morton traveled throughout this Central Asian country, living with families, visiting tribal burial grounds, and consulting with scholars. She discovered regional differences that ranged from towering monuments to hand-hewed wood posts marked with horns of mountain goats. Morton is Professor of Art at The Cooper Union and lives in New York City. She has published four books of her photography and has exhibited in more than twenty-five solo and fifty group exhibitions in the United States and Europe. Morton’s Kyrgyzstan project has been supported by grants from the Graham Foundation, New York State Council on the Arts, and University of Central Asia. Exhibition introduction by Nasser Rabbat, Aga Khan Professor, MIT Department of Architecture. The Elliot K. Wolk Gallery is free and open to the public Monday through Friday, 9AM - 5PM. The gallery is located in MIT Building 7, Room 338, at 77 Massachusetts Avenue, Cambridge. For directions, look here.